We represent those who have been injured and or disfigured due to the carelessness of another. We provide special attention to victims who find themselves in a very unfamiliar position of relying upon third party insurance to make things right. Mr. Bryan Irons formed the Irons Law Firm PLLC in 2003 and began representing bankruptcy and personal injury clients immediately. The practice has continued to grow along side of the great case results and court decisions rendered to clients of the firm. Our reputation for settling auto accident claims speaks for itself and insurance companies know we fight hard for our clients and are determined to get the best settlement possible. Auto and work related injury victims can call or text 918-260-7033 for free consult. Mr. Irons is very familiar with the ins and outs of semi truck accidents. Don't hesitate to contact the law office; there are specific things that must be addressed whenever a semi truck is involved in an incident. The Irons Law Firm employs an investigator whose job is to document events, photograph the scene and gather information as soon as we learn about the incident. We take our clients situation very seriously; we fight it like it were our own. 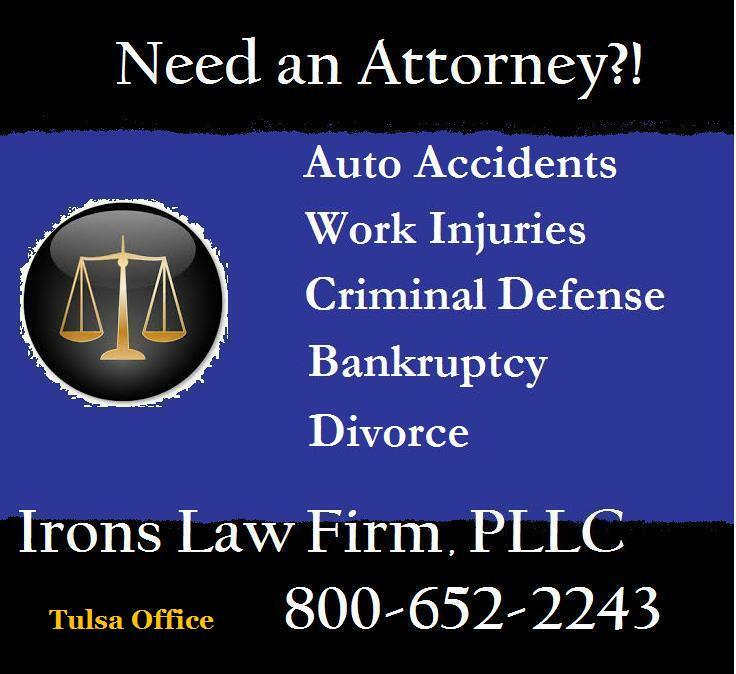 Auto Accident Team: Our team was working in injury law even before attorney Bryan Irons gathered us all together and formed the Irons Law Firm PLLC. We are very conscious of our clients' needs, they are a vital part of our legal team and we work closely with them to discover, prepare and execute favorable compensation. The law firms' growth has been in conjunction with its successes and over the years we have become very proficient in areas such as Semi-Truck incidents. The #1 difference is accessibility; being able to contact the attorney, investigator or case manager at almost any time of day is unheard of in a law firm. Our strengths are in the areas of personal injury. Our team is very laid back, we encourage our clients stop by and say hello.